Fishing tackle, Superior Quality G Loomis fishing rods and even a few fish stories! Shore Lunch can be added on for 15$ per person. Rainy Lake Fishing Guides will provide everything you need for a great experience on beautiful voyageurs national park and Rainy Lake! camera, sun glasses, sun screen, if you want your favorite fishing pole and a cooler with beverages of your choice! 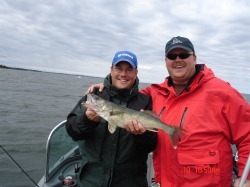 Follow boats with Rainy Lake Fishing Guides are 100$. Rainy Lake rock reefs have been known to eat a few propellers!